“David Geffen called and asked if I would like to produce the Supremes. I thought Motown was a small receding speck in my rear-view mirror and suddenly here they were with a dream project” (245). So begins Jimmy Webb’s memory of working with The Supremes, as told in his 2017 book The Cake and the Rain: A Memoir. Webb had spent time as a writer for Motown early in his career, turning in “My Christmas Tree” for the 1965 Supremes album Merry Christmas, but it wasn’t until he left the company that he hit it big, penning classic songs including “MacArthur Park,” “Up, Up And Away,” and “By The Time I Get To Phoenix.” By 1972, Webb wasn’t just a successful songwriter, but also a recording artist himself, releasing a series of critically acclaimed albums. Upon getting the call to work with The Supremes, Webb remembers thinking, “Perhaps we could rework the franchise and cut something that would take advantage of the singer-songwriter wave currently inundating the nation” (246). Unfortunately, fans wanting to hear that strength on record wouldn’t find it here. Producer Webb cut a terrific batch of songs which basically amounts to a solo pop album for Jean Terrell (aside from one cut fronted by Mary). It’s a good album, and a showcase for Webb as a writer and producer; it’s not, however, really a Supremes album. According to Webb, “I…wasn’t getting the sound I needed. I called Darlene Love and she brought in Fanita James and Jean King and now the sound was fat. The Supremes backgrounds never sounded so good” (246). He’s half-right; it certainly is a big sound. But he completely missed the fact that smooth, polished backgrounds were an essential ingredient of the Supremes sound; even when The Andantes were added to Supremes songs (as on Floy Joy and other albums), the additional voices generally didn’t muddy the sophisticated blend. 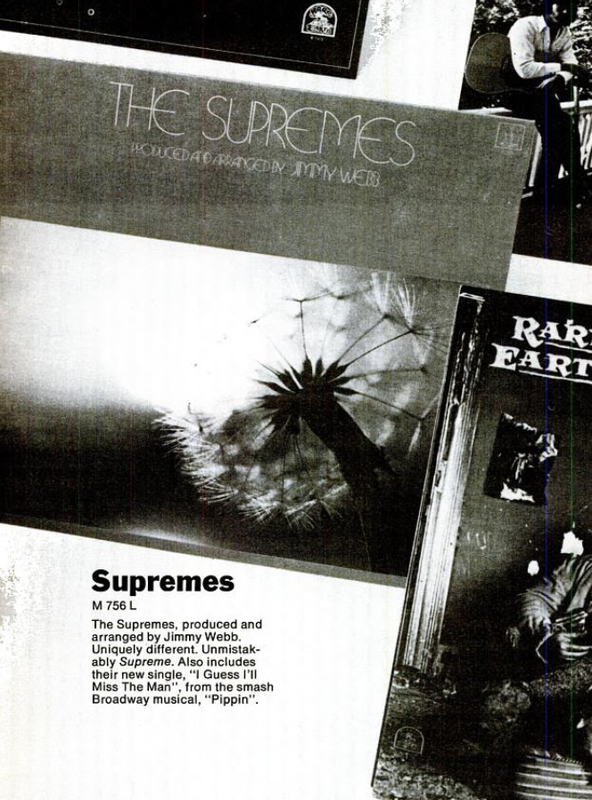 When it was released in November of 1972, The Supremes — Produced And Arranged By Jimmy Webb garnered some good reviews and was named “Best New Album of the Week” by Billboard. But it tanked commercially; none of Webb’s productions was even released as a single. 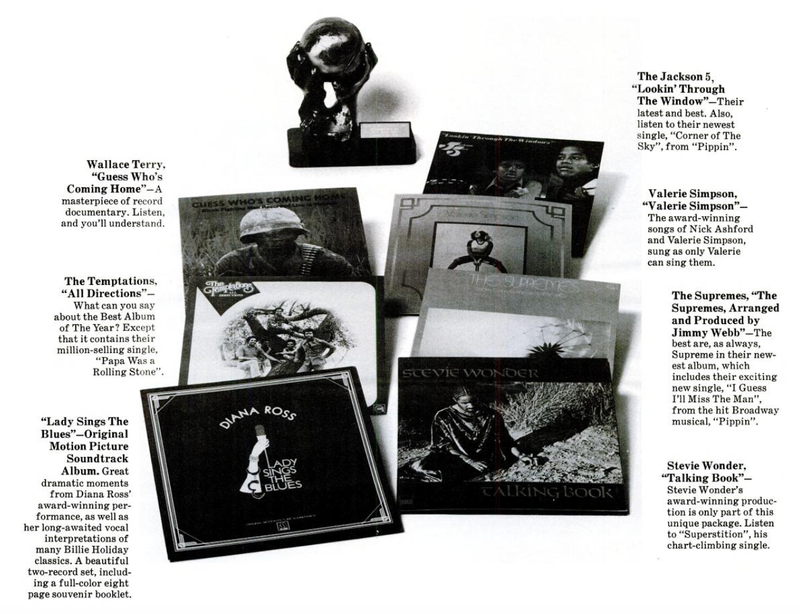 Webb blames part of the failure on the generic cover design, saying Motown should have called attention to the group by featuring their pictures on the front. This is a good point, but Webb also does little to establish a group identity with his music; aside from her one solo, good luck finding Mary Wilson’s voice anywhere on the album, or Lynda Laurence’s. Today, the project is best looked at as something of a concept record, in the way that The Supremes Sing Rodgers & Hart or the Funny Girl albums were. There’s really interesting, complex music to be explored here, but if you’re not a fan of the Jimmy Webb sound, there’s not much for you here. 1. I Guess I’ll Miss The Man: Let’s face it, Motown always played fast and loose with the rules. The Supremes Sing Country, Western & Pop was positioned as a country standards album, but featured several songs that were Motown originals. Same goes with A Bit Of Liverpool, which included a Smokey Robinson cut and one written by Berry Gordy, Jr. 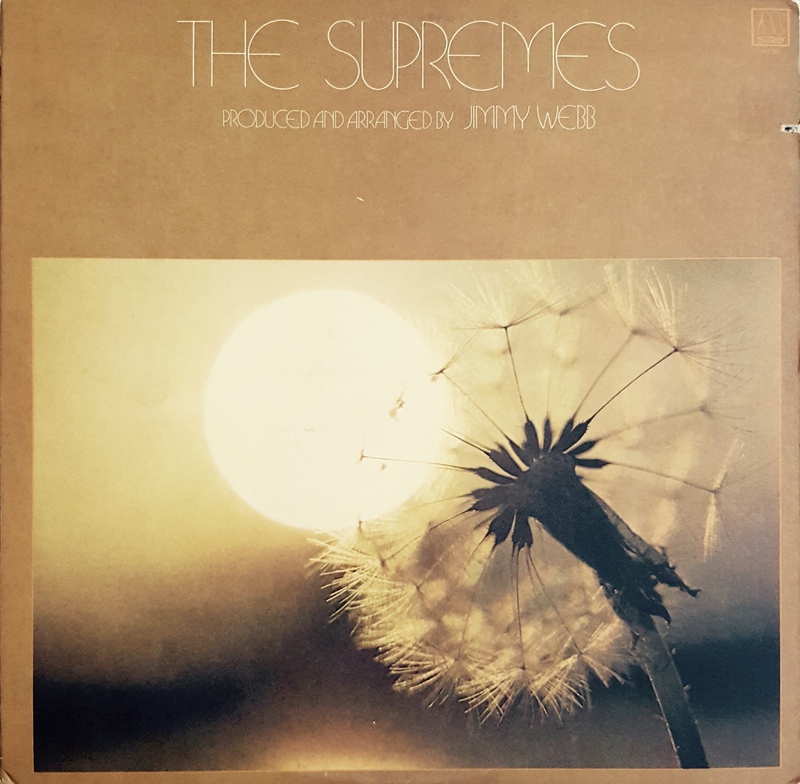 So it’s really no surprise that an album titled The Supremes — Produced And Arranged By Jimmy Webb would open with a track that wasn’t produced by Jimmy Webb, wasn’t arranged by Jimmy Webb, and wasn’t even written by Jimmy Webb. “I Guess I’ll Miss The Man” is a beautiful ballad from the Broadway musical Pippin, which premiered in October of 1972 at the Imperial Theatre and ended up winning several Tony Awards. The musical also happened to be financed by Motown, and in a shrewd marketing move, the label had several of its top acts record and release songs from the score. The Jackson 5, for example, had a Top 20 hit with “Corner Of The Sky,” Michael Jackson recorded “Morning Glow,” and The Supremes lent their voices to this one, released as a single on September 15, 1972. Deke Richards and Sherlie Matthews produced the cut; Richards had just worked with former Supreme Diana Ross on her second solo album, Everything Is Everything, and Matthews was a prolific singer, songwriter, and producer who’d already turned in “But I Love You More” from the 1970 Supremes LP Right On. Richards and Matthews give the song a low-key, acoustic arrangement; the beginning of the track is very stripped-down, and slowly builds in intensity with the addition of some lovely strings. There’s a haunting quality to the background voices, which seem to softly wail like ghosts behind Jean Terrell, who turns in a lean, emotional performance. Miss Terrell had sometimes strained a bit on previous ballad performances; on earlier single “Touch,” for example, she seems to be working a little too hard to put over the lyric and showcase her voice. Here, however, she is pitch-perfect, transmitting a feeling of helplessness through her restraint and focus. Given the strength of the finished record and the buzz building around Pippin, this must have seemed like a surefire hit. Unfortunately, the single barely scraped the charts, topping out at #85 on the Billboard Hot 100 and missing the R&B chart altogether (it did, however, manage #17 on the Easy Listening chart). The good news is that the addition of “I Guess I’ll Miss The Man” isn’t terribly jarring here; the arrangement boasts enough elements of pop and folk music that it fits in well with the Jimmy Webb material. It’s also a much less cluttered production than the rest of the songs, which makes this a welcome inclusion. 2. 5:30 Plane: This song had already been released as a single back in 1968, produced by Webb on a group called Picardy; at the time, Billboard called it “strong rhythm ballad material” and predicted it could be a hit. Produced for The Supremes, it better than a strong rhythm ballad; it’s a dynamic opener to the album and a clear standout, not to mention one of the few songs that sounds like it could have gained some airplay at the time. The track opens with Webb’s powerful piano chords set to a shuffling beat, the chord progression subtlety setting a mood of both turmoil and cautious optimism; when Jean Terrell begins singing, it’s obvious that the mood is intentional. Webb’s arresting lyrics tell the story of a crumbling relationship, and the narrator’s decision to “make it on my own” — a classic breakup ballad told with emotional honesty and intensity. 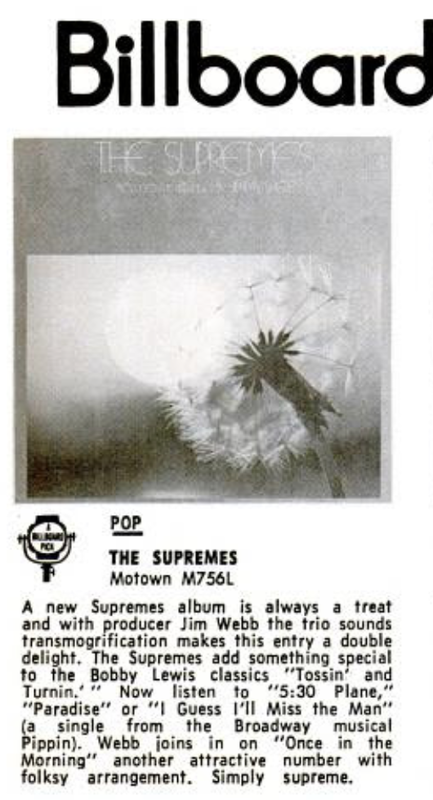 If the crisp pop production didn’t clue listeners in that this would be a different kind of Supremes album, the lyrics certainly did; Webb’s fairly abstract use of language certainly differs from the poetic lyricism of someone like a Smokey Robinson. The song opens with the lines, “All the empty reasons that we give ourselves/For going on are dying in your misty eyes,” and just the fact that the lines are broken up in such an unorthodox way speaks to Webb’s different style of storytelling; he also creates a sophisticated rhyme scheme that’s really a lot of fun to listen to. As the song builds to the refrain, a bittersweet declaration of independence, it’s delivered with just the right emotional investment by Jean Terrell; the singer’s silken voice sounds just a little strained from time to time, as though she’s working a little harder than she needs to, but it helps sell the story of a woman freeing herself from a failing relationship. The whole thing is really quite cinematic; Hollywood missed the boat on this song, which would have made a great closing theme to a romantic drama of the period. And because it’s so cinematic, the big choir of female voices backing Jean Terrell don’t sound terribly out-of-place; the bigger sound actually seems to add to the story being told. “5:30 Plane” sets the bar for the Webb-produced material very high; it’s a touchstone for not only the album, but for the entire 70s Supremes discography. 3. Tossin’ And Turnin’: This song, as performed by Bobby Lewis, was the biggest hit of 1961, named by Billboard as that year’s #1 Hot 100 and R&B single after spending an astounding seven weeks at the top of the pop chart. The rollicking tune became an instant classic; it still shows up in television shows and movies all the time, and gets plenty of spins on oldies radio stations around the world. 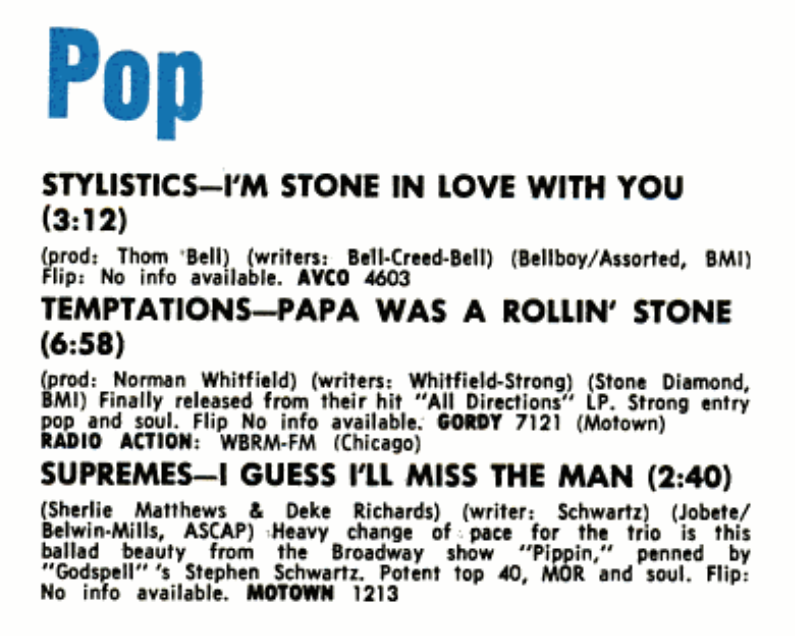 Interestingly, country singer Ronnie Sessions was having a minor hit with the song at the end of 1972, just as this Supremes album hit store shelves; his version is pure honky-tonk, while Jimmy Webb opted to keep his arrangement close to that of the original recording. Opening with a tremulous piano intro and Jean Terrell pleading, “Can’t you see/What you’re doing to me?” the song quickly picks up steam with a rocking horn-and-organ-laced track; although it’s slickly produced, Webb creates a spontaneous energy that mimics the feel of a live performance. This song is a tour de force for Terrell, who tears into the material with abandon and turns in into a real soul workout; in his book, Jimmy Webb calls Terrell, “a powerful singer, more from the Aretha Franklin mold of gospel influence” (245), and you can really hear what he means in this performance. Listen, for example, to the amazing sound the singer produces at 1:57, and she stretches a single note up the scale until she finally just screams into the microphone; it’s unlike anything we’ve heard from her before. The background vocals are also very strong here; the original recording’s memorable background arrangement is essential to its success, and Webb wisely leaves it intact. A nice addition is the playful banter of the background singers during several verses, turning them into “girlfriends” commiserating with the lead singer; again, this helps add to the spontaneous feel of the recording. 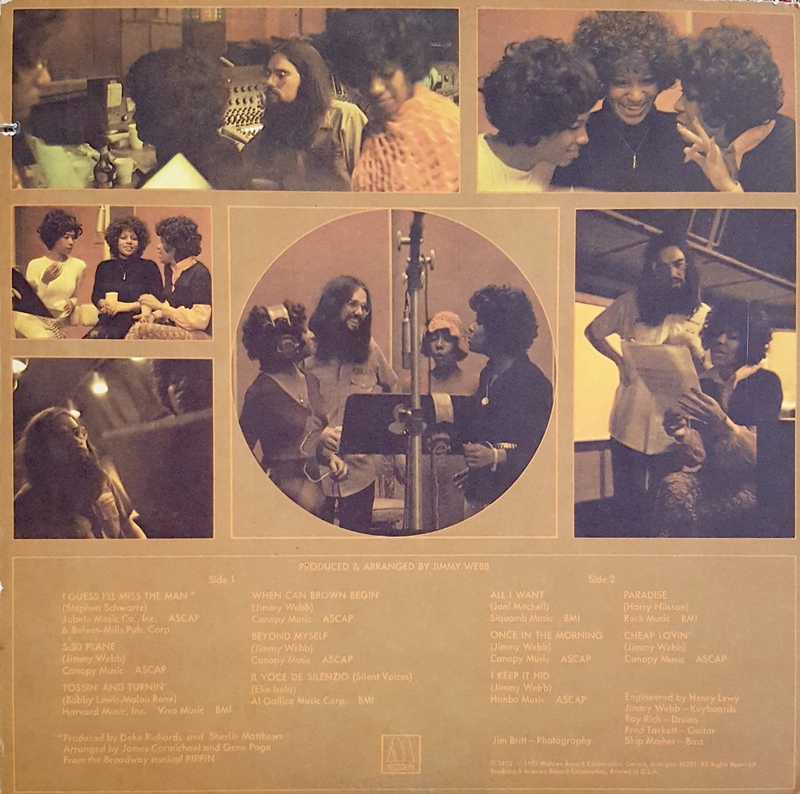 As with the album’s previous track, “Tossin’ And Turnin'” is extremely strong and could have done well at radio; Ronnie Sessions had his country hit with the song, and Philadelphia International’s Bunny Sigler charted with a cover in February of 1973, and The Supremes could have done the same thing had Motown given it a chance. 4. When Can Brown Begin: In his 2017 book The Cake and the Rain: A Memoir, Jimmy Webb traces the origins of this song to attending a Sammy Davis, Jr. show in 1968. He writes, “After his show Sammy came out and joined us. He and I had a most spirited conversation about civil rights, which ended with his demanding, ‘Why doesn’t someone write a song called When Can Brown Begin?’ I wrote the title on the back of a linen napkin and carried it away with me” (217). The song he eventually came up with is a moving introspection on race relations, asking the central question, “If white is right/And black is beautiful/Lord, tell me, When Can Brown Begin?” — in other words, what good does it do to keep groups of people in their own little separate boxes? It’s clear how much Webb believed in this song; his arrangement is lush and full of care, marked by glossy strings and Webb’s own deeply-felt piano work. Jean Terrell’s vocal recalls her work on “I Guess I’ll Miss The Man” in its quiet confidence; she delivers some gorgeous riffs, such as the way she stretches the word “free” at 1:41 into several notes. The soaring harmonies behind Terrell are also lovely; the voices are woven into the track in such a way that they seem to be instruments themselves, adding to the tapestry of sound. Years later, this track would be included on the CD release of The 70s Anthology, and Mary Wilson would write in the liner notes, “In a time of our people singing ‘Black Is Beautiful,’ I felt ‘When Can Brown Begin’ could have been a hit. I remember how wonderful it was to be singing such a socially poignant song.” Certainly The Supremes had sung socially conscious material before; they Diana Ross-led group delivered a powerful call for racial harmony on primetime television, during the 1968 TCB special. But interestingly, the 70s Supremes hadn’t really addressed race on record in this way, which make this a really special recording. Could this have been a hit for the group? It’s hard to say. But it’s become a beautiful piece of the group’s history and sounds just as relevant today as it did more than 40 years ago. 5. Beyond Myself: According to Mary Wilson, Beyond Myself was to be the original title of this album, which would have made this the album’s title track; in retrospect, changing the title was a good move, as this is easily the weakest inclusion on the album. The song itself is a pretty piano ballad; it rambles and doesn’t have a particularly memorable hook, but that’s not the issue. The problem comes in with Jean Terrell’s vocal performance. In his memoir, Jimmy Webb talks of really pushing the Supremes in the studio, to the point that Jean showed up with a doctor’s note saying the producer was damaging her voice by requiring her to sing so high (the story is on page 246). Listening to Terrell sing “Beyond Myself,” it’s easy to side with her doctor; her voice has never sounded this rough on record. It starts out okay, with low-key vocals accompanying a piano, but as the song grows in intensity, the singer’s performance becomes less and less controlled, and her voice strains higher and higher until it ceases to sound good. The perfect example comes at 2:15, as Jean sings the word “understand” and stretches it well beyond her range; it’s painful. Considering The Supremes — Produced And Arranged By Jimmy Webb has been so solid thus far, “Beyond Myself” is really a letdown. Skip this one. 7. All I Want: This is an exciting, energetic record that was written and originally recorded by Joni Mitchell; “All I Want” is the leadoff track on her iconic 1971 album Blue. Mitchell’s version is far more stripped down than what you’ll hear on this album; her melodic vocals are basically accompanied by an acoustic guitar. Here, Jimmy Webb brasses up the arrangement, seemingly taking a cue from The Supremes themselves and “You Keep Me Hangin’ On” to create a track pulsing with energy. In his 2017 memoir, Webb remembers this as being the first song he presented to The Supremes; he’s also very vocal in his admiration for Mitchell and her songwriting, so it’s no surprise he chose one of her songs to produce. Although listeners still seem surprised today that The Supremes covered Joni Mitchell, it’s not that much of a stretch; back in the 1960s, the group covered everyone from Bob Dylan to the Rolling Stones. Here, Jean Terrell acquits herself exceptionally well to the material; it’s been tailored by Webb to fit her, of course, but the singer brings a brisk energy to the song, plowing through it with maximum efficiency much in the way her predecessor, Diana Ross, was known to do. Jimmy Webb opens the track with a chugging guitar that evokes a speeding locomotive (perfect for the “traveling, traveling, traveling” lyrics) and a siren of horns heralding its arrival; there’s a swirling excitement in the extended intro, which goes on for a full 30 seconds before Jean Terrell begins singing. Producer Webb surrounds Terrell’s lean vocal with muscular backgrounds which bubble up from the track like boiling water; the soulful voices buoy the entire track. The vocals really are a key to this recording’s success; for proof, look no further than The Supremes performing this song on “The Sonny & Cher Comedy Hour” in January of 1974. By that point, Jean and Lynda were gone from the group, replaced by Scherrie Payne and a returning Cindy Birdsong; for the performance, the ladies lip-sync to their own pre-recorded vocals, which are dropped on top of Jimmy Webb’s track. Each of The Supremes gets a solo verse, and they are far more laid back in their delivery than Jean Terrell and the backing voices are on the studio version; the result is a performance that feels like sloppy karaoke, with the lack of energy sinking the production. In the studio, Jimmy Webb obviously coaxed a real excitement from the singers, and it makes all the difference. If Motown had been willing to release one of Webb’s productions as a single, this one probably had the best chance at becoming at hit; as far removed as Joni Mitchell might seem from The Supremes, this ends up sounding like a natural evolution of the youthful urgency present in the trio’s biggest hits of the previous decade. 8. Once In The Morning: Back in 1970, Motown had been hesitant to release “Stoned Love” by The Supremes for fear that people would mistake the song for being about drugs. So there’s a good chance they had no idea what “Once In The Morning” is actually about; according to Webb in The Cake and the Rain, “‘Once In The Morning’ was a cocaine song, a satire on Freud’s Rx to patients…he prescribed a dollop of coke ‘once in the morning’ and ‘once at night'” (247). The song is actually duet between Jean Terrell and Webb himself; the writer had already recorded the song for his own 1972 album Letters, and he keeps the exact same arrangement here, merely re-working the vocals. The result is a country-pop collaboration which works surprisingly well; Terrell and Webb volley back and forth nicely, adding in a lot of little playful flourishes to their performances, and there are some really interesting harmonies during the song’s refrain. The way Webb underscores Terrell’s voice during those refrains verges on Fleetwood Mac-territory; she sings the melody, and his voice slides up and down the scale under hers, creating an aural dance that’s really fun to listen to. Jean Terrell sounds like she’s having a good time on this one; listen to her sing at 1:42 (“I was hanging ’round London/tryin’ to pick up a new line”) of an example of a really different tone than we’ve heard from her before. Terrell’s early work with The Supremes was sometimes marked with a sameness in the way she approached each song, and it’s nice to hear such experimentation with her on this album, and this song in particular. It’s unfortunate that, once again, there are no other Supremes to be found on this recording; it’s three verses long, and perhaps Mr. Webb could have given Mary, Lynda, and Jean each a turn at a solo here. But it does work well as it is, thanks to the unique performances of both singers, and is a memorable addition to the album. 9. I Keep It Hid: This song has been recorded by several notable artists, ranging from Glen Campbell to Ray Charles to Linda Ronstadt; here, Miss Mary Wilson gets a chance to dig into the beautiful ballad, about which she would later say, “The lyrics seemed as if I had written them myself” (The 70s Anthology). Indeed, there’s an intimate, confessional quality to the lyrics which makes the song a good fit for Wilson’s warm, misty voice; as producer Harold Beatty would later say, “There was something honest about that voice” (The Supremes box set). Webb’s production comes right at the intersection of country, pop, and soul; his own twinkling piano opens the piece, leading into a shuffling 3/4 time signature that seems to come straight out of a dusty honky-tonk bar somewhere in the American West. Wilson quietly croons into the microphone during the first verse with such simplicity that, frankly, it sounds a little jarring at first, especially coming after the heightened vocals of “Once In The Morning.” However, as the song swells to a powerful refrain, she’s backed by a large, mournful group of voices that adds a lot of emotion; it’s a nice move by Webb to keep Wilson solo during the quiet voices, and then have the backgrounds join her for only the moments of dramatic intensity. Wilson’s best moments probably come at the end to the song, as she ad-libs some gorgeous high notes from way up in her “head voice” (if you really want to hear how high she can sing, check out her amazing performance of “The Way We Were” on British television in the late 1970s). To be honest, this isn’t Mary’s most distinguished vocal performance of the decade; there’s no denying that her voice would get stronger as she took more and more leads, and she’d develop much more of her own style in time. But there is a lack of artifice in her performance, which is refreshing, and it’s nice to hear another Supremes get a chance to shine on this album. 10. Paradise: This is a fascinating song choice for The Supremes, in that it harkens right back to the trio’s girl-group roots of the early 1960s. “Paradise” was co-written by Harry Nilsson and had been cut by Phil Spector on The Ronettes back in the 1960s (there’s also a version by The Shangri-Las). Webb predictably takes Spector’s classic “Wall of Sound” production and transforms it into another majestic pop-opera, recalling his work on the earlier “Silent Voices” (which, remember, I had compared to Nilsson’s “Without You”…and here we are with a song actually written by Nilsson, also given a bold and theatrical treatment). You’d be forgiven for thinking the first verse of this “Paradise” was taken from a Disney film; Jean Terrell’s delivers the sing-song melody in a thin, childlike voice, singing of crossing rainbows and time standing still. But with the arrival of the refrain comes an explosion of sound that’s as over-the-top as anything on this album so far; the layers of voices repeating the song’s title seem to go on forever (coincidentally, or maybe not, the Ronettes were almost certainly backed by Darlene Love, Fanita James, and Jean King, who are backing The Supremes here). The entire thing is very, very syrupy — you might actually feel like you’re drowning in Mrs. Butterworth’s listening to it — but the sound Mr. Webb achieves is unquestionably impressive. It feels like he’s trying to outdo Phil Spector, and in terms of drama and pure volume, I’d say he succeeds; props must also go to Jean Terrell for holding her own against the Amazonian backgrounds and not getting lost in the giant arrangement. That said, as with “Silent Voices,” it’s really stretching things to call this a Supremes record; even though Mary Wilson and Lynda Laurence might be singing on the track, it sounds even less like them than the 1960s recordings that didn’t feature any actual Supremes on backgrounds. “Paradise” emerges as an impressive document of Webb’s capabilities as a producer, but really doesn’t showcase The Supremes in any meaningful way. 11. Cheap Lovin’: Back in the late 1960s, Jimmy Webb had produced Thelma Houston’s debut album, called Sunshower; this was long before the singer signed to Motown and enjoyed a #1 hit with “Don’t Leave Me This Way.” One of the songs on that album was “Cheap Lovin’,” a fiery workout that showcased Houston’s powerful vocals, and Webb recreates it here as a similar vehicle for Jean Terrell. There is energy to spare in this recording, which outdoes both “Tossin’ And Turnin'” and “All I Want” in terms of red hot excitement; Webb creates a driving track that’s a cyclone of horns, sharp guitars, and soulful organ work. Jean Terrell shreds the melody, digging in with everything she’s got; in retrospect, it’s the best way possible the singer could have ended the final studio album of her Supremes career. She gets to deliver some great lyrics, too, boasting she’s a “Hard, fast drinker/With a good head-shrinker” and pledging not to give her phone number out to any more strangers. The idea of the reportedly conservative Jean Terrell partying all night and picking up random men is ridiculous, but she sings with such conviction that you believe everything she says; this is a tough, aggressive Terrell, far removed from the lady that was singing about “Paradise” only a few minutes before. “Cheap Lovin'” is a real standout on this album; it was named as the album’s best track in a New York Times review, and again, it’s a mystery why the brass at Motown didn’t take a good, hard look at the material it had here. Had this song been thrown at R&B disc jockeys, surely it could have gained some support; it would have sounded phenomenal blasting out of radio speakers back in 1972-1973. Hell, it sounds just as good blasting out of radio speakers today. It’s been long said that this is Jean Terrell’s favorite album as a Supreme; I’m not sure if that’s true, but if it is, it makes perfect sense. This is the best work she ever did at Motown; she’s been handed a very challenging collection of songs here, and when she nails them, she really nails them. Mary Wilson would also say in the liner notes to The 70s Anthology that she’d never seen Jean happier in the studio than when she was recording this album, so it must have been crushing when it performed so poorly. The Supremes — Produced And Arranged By Jimmy Webb peaked at a dismal #129 on the Billboard 200, the worst showing yet for the 70s Supremes (discounting their Four Tops collaborations), and it was a blow from which the trio wouldn’t recover. Rumors soon began swirling that The Supremes would leave Motown, following in the footsteps of The Four Tops and Gladys Knight & The Pips, among others. This entry was posted in Uncategorized and tagged Jean Terrell, Jimmy Webb, Lynda Laurence, Mary Wilson, Motown, The Supremes -- Produced And Arranged By Jimmy Webb (1972). Bookmark the permalink. needless to say this was never a favorite of mine, for many reason, the least of it being the awful cover art. but I do remember loving , Keep It Hid, When Can Brown Begin, Silent Voices. but as usual you have made me want to go pull out this cd and have another listen. I did think it was strange to include songs such as Tossin and Turnin , and Cheap Lovin at the time as they didn’t seem to fit the group. I do feel that ,although Jens does a good job , having Mary do a lead was a welcome change of pace. wish Webb would have allowed Lynda Lawrence a lead and left their original vocals. I just didn’t care for the other voices as it seemed to over the top to me. but you did make a point that music was changing around 1972-73 or so but ,this really doesn’t seem to a Supremes album. I think you got it right , it is more of a Jean solo effort. Enjoy your listen 🙂 It is such a shame that Lynda really isn’t audible anywhere on this album — she has a great sound and added a nice brassy quality to the backgrounds, which is completely hidden here. This is a great effort for Jean and Jimmy…but a disappointing one for The Supremes. I absolutely agree that this doesn’t sound like a Supremes record-and that’s the problem for me. Frank Wilson had done a great job of giving the 70s Supremes their own identity. They weren’t trying to mimic the 60s group, as many might have expected, but were moving in a new direction. Yet, they still had their sound. On this, that sound is completely gone. it really is a Jean Terrell solo record. So Mary’s solo on “I keep it Hid” actually sounds out of place, which surely is not right. I actually am not sure that if any of the Webb tracks had been released as a single, they would have done well, mainly because the sound is just too different. Perhaps “Tossin’ and Turnin” as it is more radio-friendly, and catchy, in the way that “Floy Joy ” was. I remember liking the song when i first heard the album. I would come to appreciate the other songs more in time but at first they just weren’t as appealing to me as the songs on the previous albums. Maybe the album was a bit too ahead of its time and hence is more appreciated today. I agree that overall, the album just isn’t as appealing as something like TOUCH due to that complete lack of a “Supremes sound” here. In his book, Webb seems to be under the impression that Diana has just left the group and that he was re-establishing the group — as you mention, Frank Wilson had already done that, and nobody could have done it better! Hi Paulie! Cannot wait to slap this vinyl on later today and revisit. As above, THE ALBUM COVER IS THE STUPIDEST OF ALL TIME! Three gorgeous Supremes and instead we get a dandelion? Please at least stick the ladies posed in the background. It was delivered DOA from the get go with that cover. Miss The Man is beautiful and with a bit of a punched up sound I think it could have been a big hit…. Tossin and Turnin I think is so horrible I can never get thru it – ear murder. And as much as I love Jimmy Webb (His production of Cher’s STARS 1975 is an aural masterpiece) I feel he never got the “Supremes” concept and as a result this was the begining of the end for the trio. With the group changes it would have had a difficult time staying together without stellar material and production – even though there are some FANTASTIC cuts in the next few releases – this one is a big yawn. Make a wish on that dandelion! “Ear murder” is exactly how I’d describe “Beyond Myself” — how could anyone ever let Jean Terrell sound so bad on record??? It’s painful to listen to. I think you’re right — Webb didn’t “get” The Supremes at all. In his book, he seems to think that his is the first album for the group post-Diana Ross — and talks about his attempts to re-establish the “new” group. But, of course, Frank Wilson had already done the best job possible re-establishing the group — what Webb did, unfortunately, is to cut a great Jimmy Webb album featuring the voice of Jean Terrell. I do like the album — but it’s hard to look at as part of the trio’s discography because it just doesn’t fit. This was an interesting read. Thank you for putting it together. However, The Shangri-Las were never produced by Phil Spector, and most of their recordings were done in New York. Their version of “Paradise” was produced by their main producer, George “Shadow” Morton, and arranged by Artie Butler. 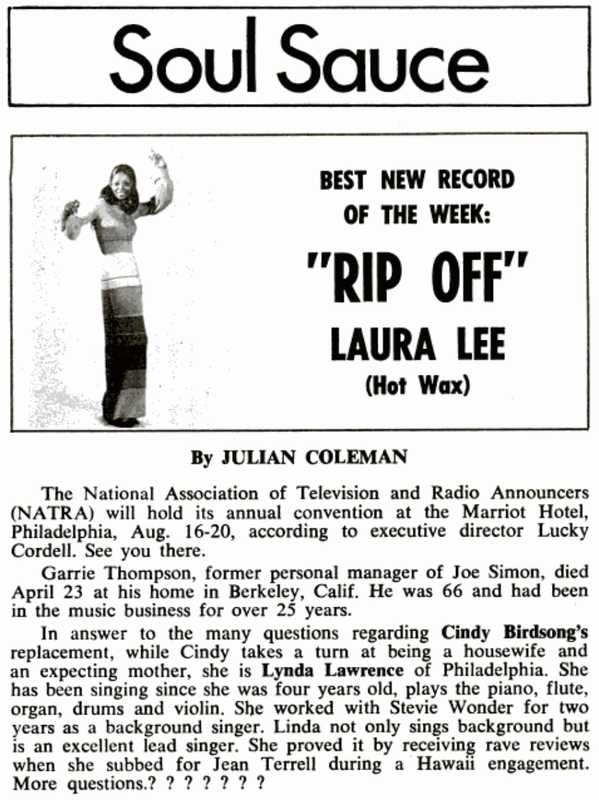 I have had mixed emotions about this record since it was launched and crashed in 1972. It is sad and annoying to hear Jean strain to hit high notes only to fall flat and out of breath. Yes, I miss hearing Lynda and Mary but I also like the overblown back up vocals that swoop in just in time to cover Terrell’s faltering vocals. 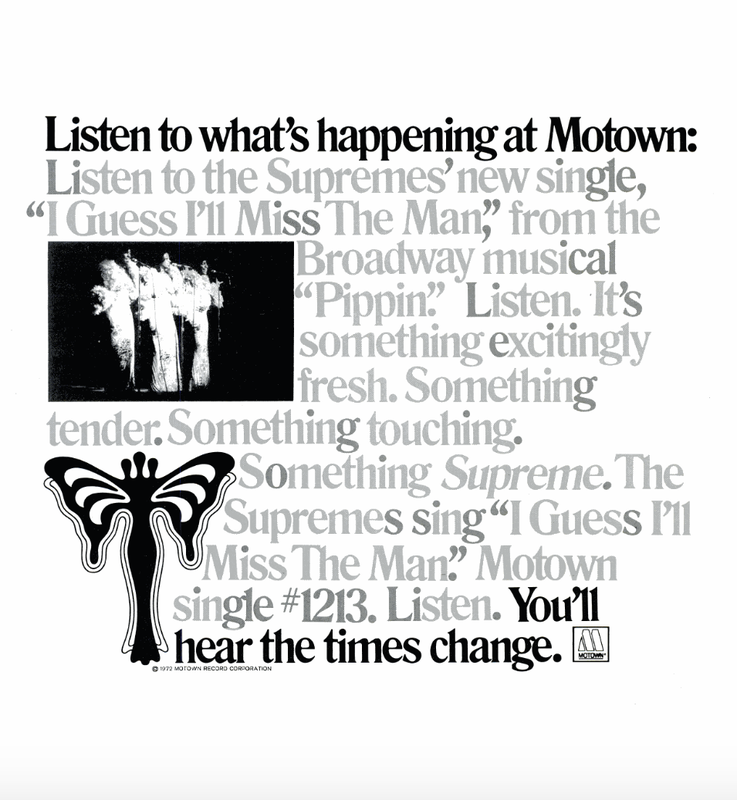 I’m glad Motown and The Supremes had the guts to try something different…because the Supremes sound wasn’t selling records any more.